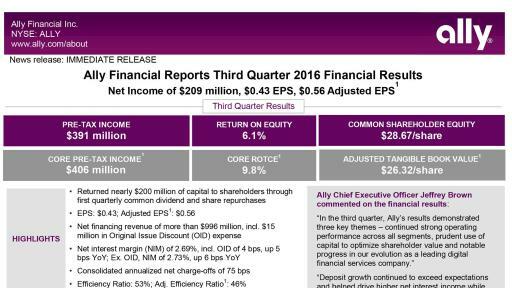 PR Newswire, CHARLOTTE, N.C. (Oct. 26, 2016) – Ally Financial Inc. (NYSE: ALLY) today reported its third quarter 2016 financial results. View the full press release in pdf. Ally will host a conference call today at 9:00 a.m. EDT to review the company’s performance. The call will include a review of the results, followed by a question and answer session. Conference Call Information: Dial 877-407-5376 (or +1-262-558-6162 for international access) at least 10 minutes prior to the start time and enter the conference ID code 93550732. Archive: A taped replay of this call will be made available from 12:00 noon EDT on Oct. 26, 2016, until Nov. 2, 2016. Please dial 855-859-2056 (or +1-404-537-3406 for international access) and enter the conference ID code 93550732 to access the taped replay. A replay of the webcast will also be made available on the Ally Investor Relations website. 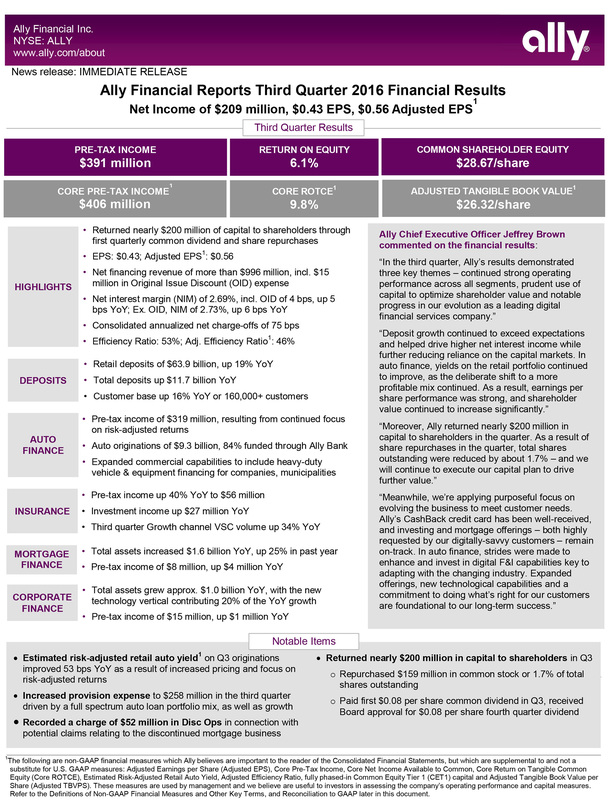 Ally Financial Inc. (NYSE: ALLY) is a leading digital financial services company and a top 25 U.S. financial holding company offering financial products for consumers, businesses, automotive dealers and corporate clients. Ally’s legacy dates back to 1919, and the company was redesigned in 2009 with a distinctive brand, innovative approach and relentless focus on its customers. Ally has an award-winning online bank (member FDIC), one of the largest full service auto finance operations in the country, a complementary auto-focused insurance business, a growing digital wealth management and online brokerage platform, and a trusted corporate finance business offering capital for equity sponsors and middle-market companies. The company had approximately $157.4 billion in assets as of Sept. 30, 2016. For more information, visit the Ally press room at http://media.ally.com or follow Ally on Twitter: @AllyFinancial.